Climate change = Sad polar bears? Not here. Scientists say local climate changes mean hotter, drier summers, more flooding in our valleys and less snow in our mountains, impacting everything from your property to salmon to public health to native plants. 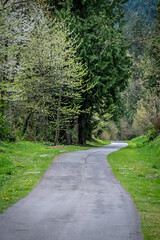 Please join King County Executive Dow Constantine and a troop of climate and sustainability experts on Monday, April 18 at 11 a.m. for a live online discussion about what we can expect from climate change in the Puget Sound region, what King County is doing to support a sustainable, prosperous local economy and minimize the government’s environmental footprint, and how you can help. 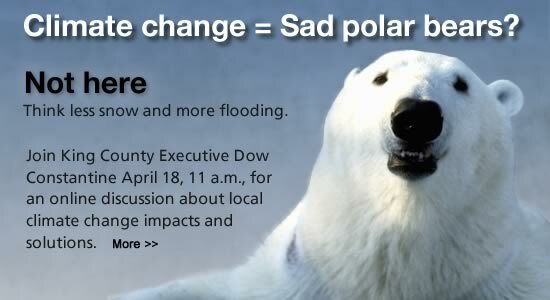 If you already have a question you know you want to ask, tweet it in advance to #askdow or email it to climatechange@kingcounty.gov.